I have shared sooooo many images of inspiring homes, lovely interiors, and dramatic renovations over the years (um, this is my 9th year of blogging on Hello Lovely! 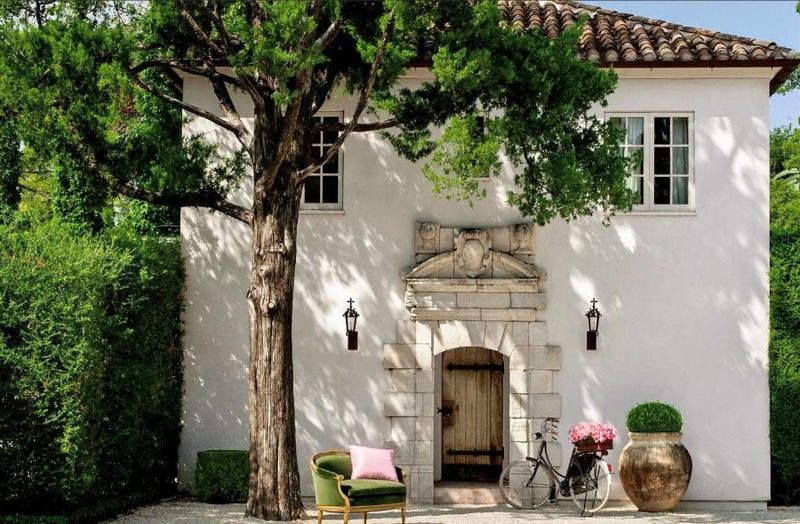 ), yet if pressed to identify just one solitary moment of French inspired home perfection, it would have to be this one…its stucco exterior, tile roof, elegant lanterns, rustic planked door, and limestone detail hugged by all that lush greenery makes me weak in the knees. I cannot seem to go a stretch on this blog without revisiting it! I know the precise moment this charming facade appeared on my radar: in the Milieu magazine mini mag that showed up in my mailbox years ago. Against all odds, founder and editor Pamela Pierce launched the most beautiful source of stunning design, and I wanted to live inside every one of Milieu’s pages. Though this home (and the bicycle with its blooms!) looks as though it could easily be located in the South of France, this moment of French Country perfection is in Houston! In fact, the home is the guest house serving the dreamy main house of Annette Schatte on Montrose Blvd. in the University Place neighborhood. Designed by Reagan Andre Architecture, the interiors were designed by Pamela Pierce. Schatte’s name may be familiar with you as the antique dealer with a keen eye for beautiful design who teamed with Babs Watkins (Watkins Schatte) offering fine antiques from Europe. Schatte later opened her own shop (and that shop is now interior designer Margaret Naeve’s M Naeve). Let’s explore unforgettable French Country interiors designed by Pamela Pierce and stunning architecture by Reagan Andre in the Schattes’ Houston property on Montrose Blvd. where this breathtaking guest house shares space. Home Tour: Fantasy French Country Home in Houston. Reagan Andre. Can you even imagine touring this fantasy Houston property!?! Look at these plaster steps and the refined iron railing! I could stare at it all day. I could. 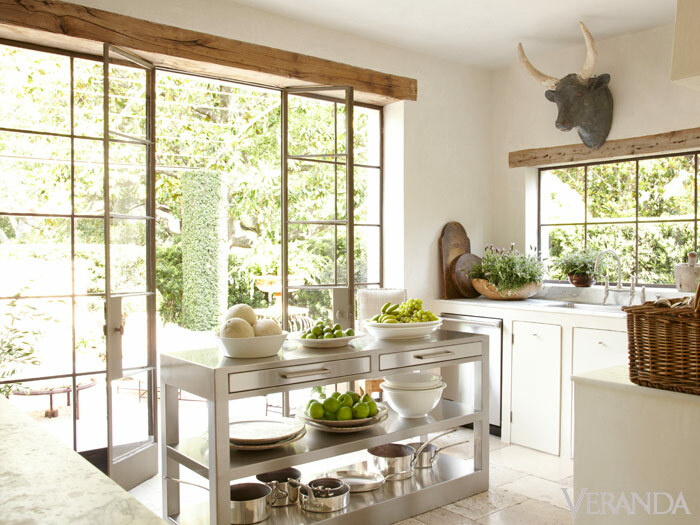 But then I might remember the heavenly sunshine of this French Country kitchen by Pamela Pierce. Just the most elegant feast for the eyes, oui? More timeless and tranquil splendor in the living spaces. The blue of the antique doors in the powder room! Aren’t the lamps and their rectangular shades amazing? Aren’t these framed botanicals amazing? In the mood for a tad more Pamela Pierce kitchen magic? FIND IT HERE. Next Post Luxurious French Apartment Rental in Carcassonne + An Interview! Those rectangular-shaded lamps: where are the cords? That is always the challenge with lamps in the middle of the room. There aren’t even carpets to run the cords under. I want to know their secret! As for Provence vs. Houston, there’s only one giveaway: Houston is much greener. The South of France is very dry, and you would only see grass that green in winter. Even if it’s watered regularly, it’s so dry, the water evaporates and the grass is halfway dormant. It’s why you see so much gravel used–good for drainage in winter and doesn’t look parched in summer. I can’t complain, though–that low humidity makes summers very comfortable no matter how hot it gets. A friend has an amazing lamp made from one of those gigantic church candlesticks. I am searching for one to convert. Husband is handy that way–he can wire anything. I’m dreaming over those upstairs wood floors…! What a glorious way to start my week…beauty beyond description. Thanks for filling my senses with all this splendor, Michele! This is stunning Michele! It really looks like it could be in France. I love the simplicity of the front entry into the house. The door and architectural details around the door are elaborate but then there’s one simple potted plant and an upholstered chair outside! Love it! This home has Pamela’s name written all over it. She is amazing and Houston is so proud of her and her beautiful magazine. This particular home is a shocker because of where it’s located, once a boulevard with nothing but beautiful homes, now it’s a main thoroughfare with restaurants, a university, office, churches, and a smattering of homes, like this one, that have been completely redone by their owners. So happy to see the inside of this beauty! I musta missed that issue of Milieu! Beautiful post, which I’m saving for certain. Loving her draped tables especially.